Traditionally, insurance companies have been more depended on the broker channel and their own direct sales teams to generate sales and provide after-sales service. Thus, insurance companies invested heavily in customer contact centers, which is of no use now. So businesses are looking for effective ways, where they can share investment and risks. This headed insurance businesses to rely upon outsourcing service providers to keep their bottom line healthy. According to the research, the multinational insurance enterprises are consecutively investing in outsourcing their business operations to the developing countries like India, China, and the Philippines and it has been expected that by 2020, the average outsourcing investment will strike to 262 billion dollars. Finally, after so many years of working with outdated software and lots of paperwork, insurance companies are encountering the benefits of time, money and efforts by outsourcing their processes. 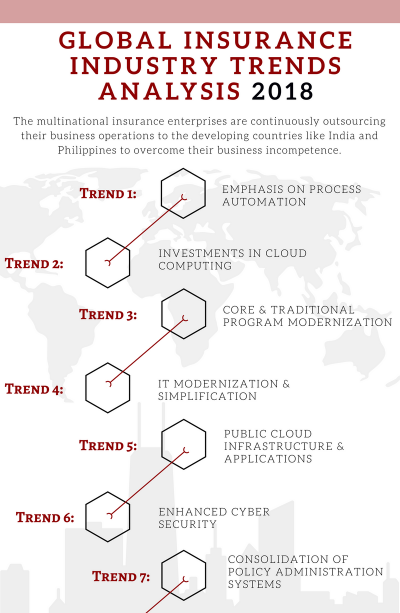 This infographic explains the current insurance market trends and impact of outsourcing services across the industry.